My focus today will be on Chapter Two. Chapter Two gets into some of the nuts and bolts of the .NET Framework and writes the initial “Hello World” application that these beginner books almost always do. 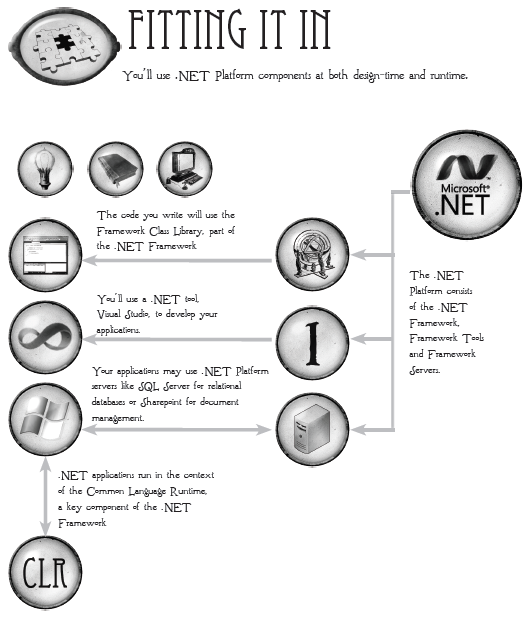 They begin by putting up a very nice illustration of how .NET works. Truly I have not seen it explained in such a way before! They give you a little quiz on what you picked up. 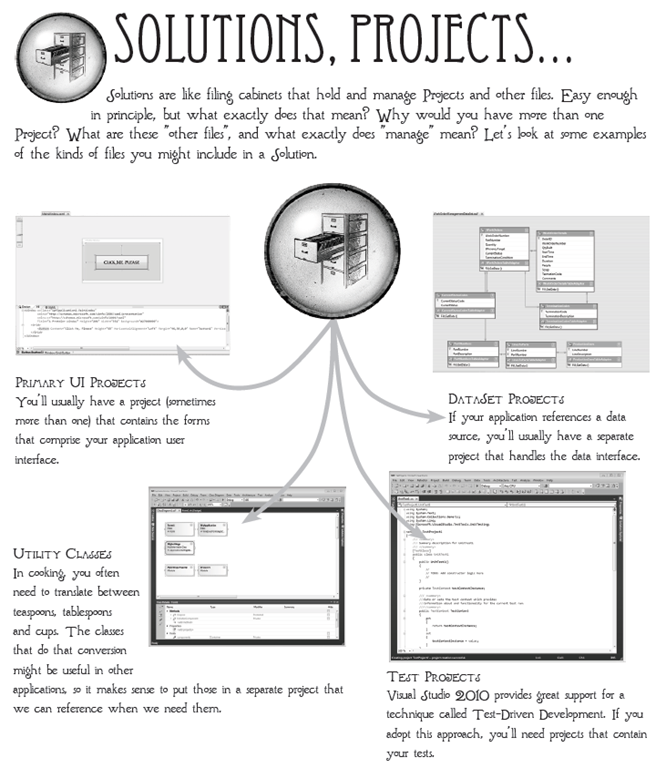 Then there is an explanation of why the .NET Framework is a better way to go than say a Visual Basic 6 way of thinking. I am not sure that to a beginner programmer they understand or need to know any of this. But they certainly make good points. Being an old VB6 and VBA programmer myself I certainly could appreciate what was said. Then they proceed into building the first application. But there is a little twist. Riordan chooses to not even bother with winforms and instead chooses to plow right into a Windows Presentation Foundation (WPF) application. At first the choice seemed odd to me. But as I considered it this makes sense. WPF is the future. Winforms is dying. It’s a sad truth but it is what it is. 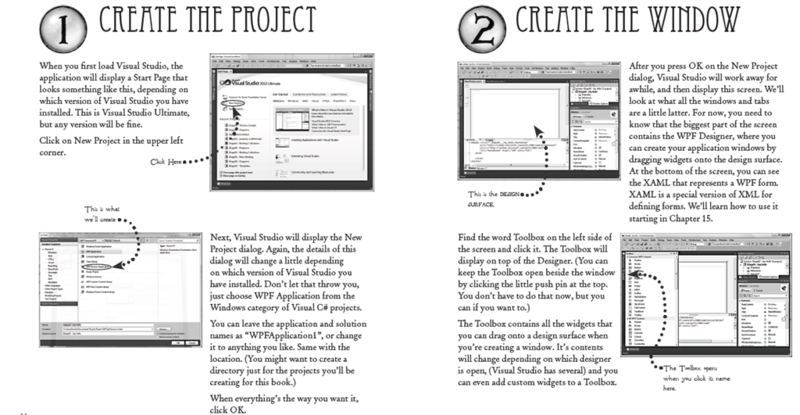 Riordan walks you through the process of creating a WPF application in Visual Studio 2010 while beautifully illustrating how to do that task. Then the first example of modifying a property in the WPF gui is introduced. Really it is quite well done. The appropriate message box appears saying “hello world!” is displayed. She tells the user to take a break and congratulates them on their first application. She then displays and explains the code editor in the same easy going manner. Another note that often goes on through out this book she often gives the novice programmer fun little facts to digest, so as to have fun while learning. Imagine that! C# learning being made fun! 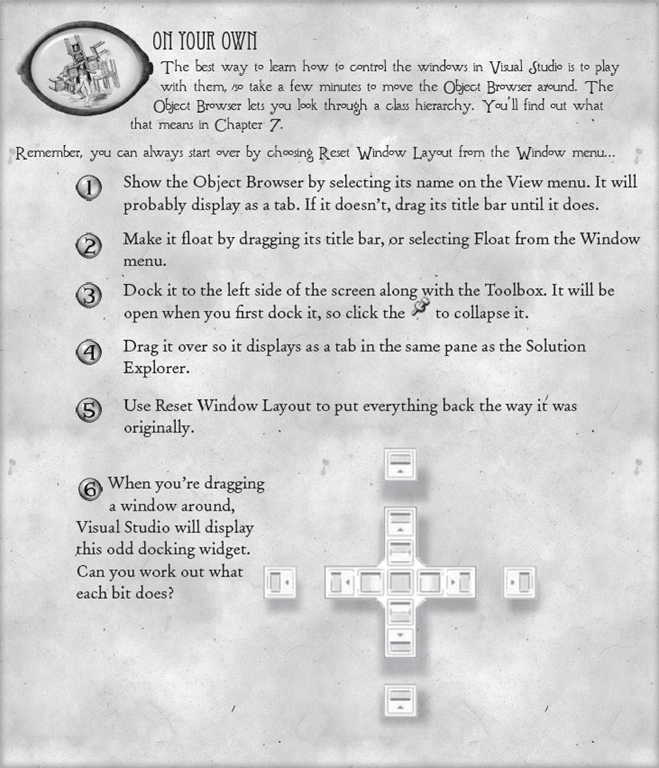 We will be covering Chapter Three in the next entry where the Visual Studio interface will be reviewed in more detail. This will list all forms or other types you specify that are in your particular Visual Studio project. It is a continuation of redoing code I have previously done in vb.net for C#. It can come in handy when documenting your code during your project. If it’s a form, do a certain set of actions, a class then do another set of actions and so on. You can find the vb.net version here. There were some changes made from that version.